513 Beacon is located on the south side of Beacon, between Massachusetts Avenue and Charlesgate East, with 511 Beacon to the east and 515 Beacon to the west. 513 Beacon is one of ten contiguous houses (511-529 Beacon) designed by architect Samuel D. Kelley and built in 1887 for Chadwick & Stillings (N. Henry Chadwick and Oscar L. Stillings), a hat block and flange company that became a significant house building firm in the 1880s and 1890s. They are shown as the owners and builders on the original permit applications, all dated March 14, 1887. The next year, Chadwick & Stillings built one more house, also designed by Samuel Kelley, at 531 Beacon. The ten houses at 511-529 Beacon are of a similar pattern, all with entrances on the east side and cylindrical bays on the west. The houses furthest east and west in the group (511 and 529 Beacon) have brick bays which extend to the third story, with two windows above the bay on the fourth story. The next two houses from either end (513 and 527 Beacon) have rusticated stone bays which are cylindrical for the first two stories and angled on the third story, with single arched window above surrounded by decorative stonework with a triangular top. The next two houses from either end (515 and 525 Beacon) have brick cylindrical bays to the third story, with three windows above surrounded by decorative stonework with a fan shape at the top. The four houses in the center of the grouping (517-519-521-523 Beacon) are variations on the same themes. 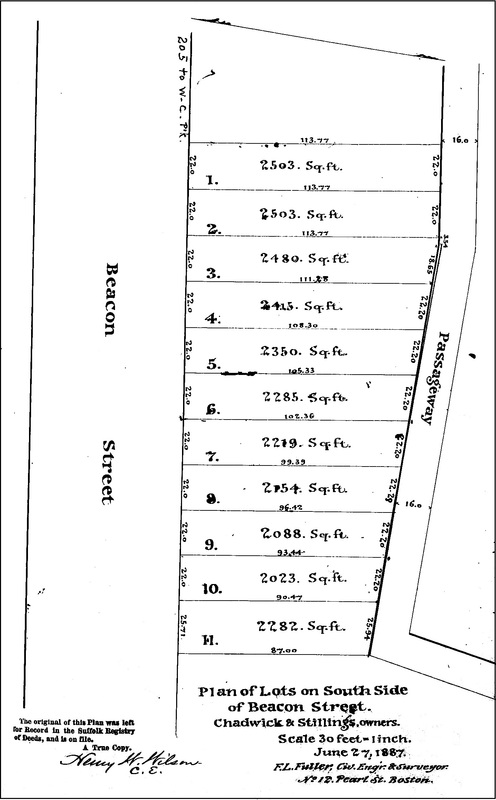 N. Henry Chadwick and Oscar Stillings purchased the land for 511-531 Beacon on June 1, 1887, from a real estate investment trust formed by Francis A. Palfrey, Francis A. Osborn, and Grenville T. W. Braman. It was part of a parcel of land the trust had purchased on June 1, 1880, from the Boston Water Power Company. 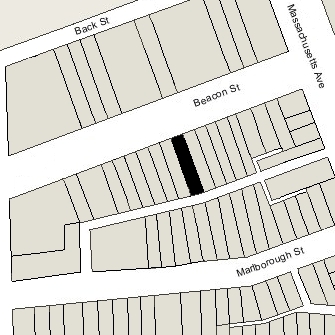 Click here for an index to the deeds for 513 Beacon, and click here for further information on the land west of Massachusetts Avenue between the south side of Beacon and the north side of Commonwealth. On June 30, 1888, 513 Beacon was purchased from N. Henry Chadwick and Oscar Stillings by Charles William Sherburne. He and his wife, Sarah (Damon) Sherburne, made it their home. They previously had lived in Somerville. Charles Sherburne was a manufacturer of luggage tags, locks, and other railroad supplies. The Sherburnes three children lived with them: Gertrude, Charles Henry, and Harriett. Gertrude Sherburne married in May of 1892 to Harry H. Wiggin, a hardwood lumber dealer. After their marriage, they lived in Somerville. Charles Henry Sherburne married in October of 1895 to Josephine May Woods. After their marriage, they lived at 513 Beacon with his parents. He was associated with his father’s firm. Harriett Sherburne married in January of 1900 to Francis A. C. Hill, a widower. After their marriage, they lived in an apartment at 290 Commonwealth. He was general manager of the Boston office of the Equitable Life Assurance Society. Sarah Sherburne died in September of 1906. 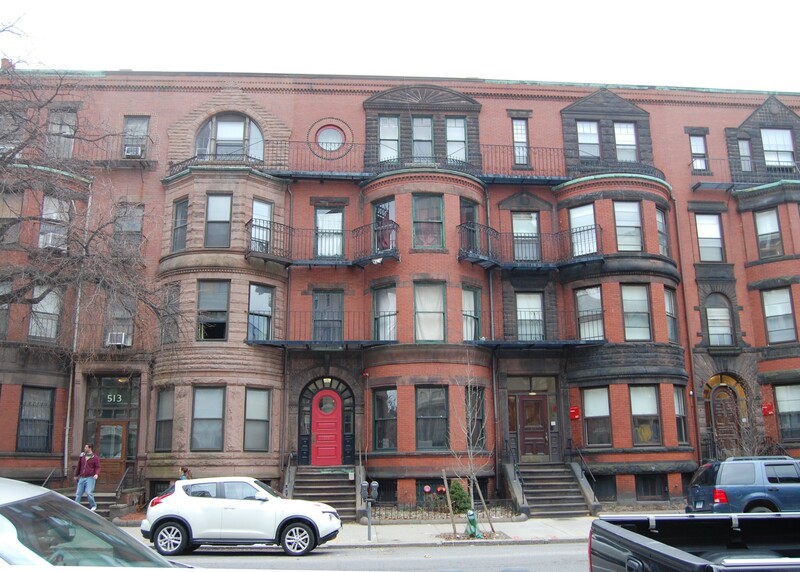 Charles Sherburne and Charles and Josephine Sherburne continued to live at 513 Beacon. Charles William Sherburne died in May of 1915. Charles and Josephine Sherburne continued to live at 513 Beacon during the 1919-1920 winter season, but moved thereafter to 419 Beacon. On March 9, 1922, 513 Beacon was purchased from Charles Sherburne, Gertrude (Sherburne) Wiggin, and the estate of Harriett (Sherburne) Hill (who died in 1921) by Annie Jane (Trimble) Varney, the widow of John R. Varney. Later that month, she acquired 515 Beacon and converted both buildings into lodging houses. She lived at 482 Beacon, where she also operated a lodging house. Over the next twenty year, the lodging house at 513 Beacon was operated by a series of non-owner managers. By the 1924-1925 winter season, it was operated by Arthur R. Gray, a railroad conductor, and his wife, Marion Inez (Sawyer) Gray. Their primary residence was at 50 St. Stephen, where they also operated a lodging house. They continued to operate the lodging house at 513 Beacon in 1926. On January 9, 1926, Joseph Y. Schooner, who held a mortgage given by Annie Varney on 513 and 515 Beacon, foreclosed and sold both houses to Helen Christina (Lamos) Toner, the widow of Charles Henry Toner. She was a real estate agent and lived in Dorchester. In 1927, the lodging house at 513 Beacon was operated by Frederick H. Gay, a carpenter, and his wife, Georgina Gay. They previously had lived in Somerville. They had moved by 1928. 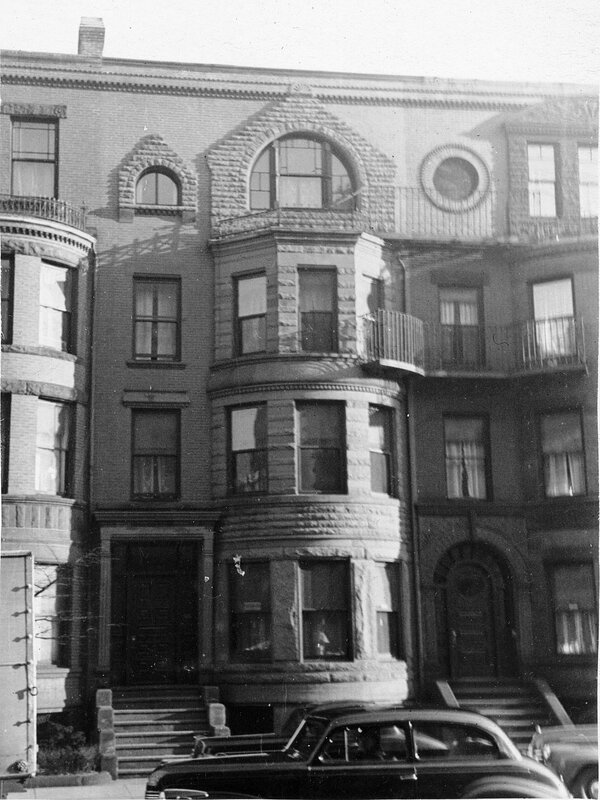 By 1929. they were living in Somerville again, and by 1930 they were lodgers at 445 Beacon. On September 29, 1927, the Brookline Savings Bank foreclosed the mortgages given by Helen Toner when she purchased 513 and 515 Beacon and sold both houses to Joseph Y. Schooner. He was a note broker and dealer in mirrors. He and his wife, Carrie (Raphael) Schooner, lived in Brookline. He died in June of 1931 and the property continued to be owned by his estate. By 1930, 513 Beacon was the home of Frank J. Hurson, a watchman in factory, and his wife, Helen M. (Hennessey) Hurson, who operated it as a lodging house. They previously had lived at 521 Beacon. They continued to live and operate the lodging house at 513 Beacon in 1937, but had moved to 54 Blue Hill Avenue in Roxbury by 1938. On December 21, 1937, the Boston Five Cents Savings Bank foreclosed on its mortgages to Joseph Y. Schooner and took possession of 513 Beacon and 515 Beacon. By 1938, 513 Beacon had become the home of Thomas F. Burke and his wife, Ellen (Nellie) J. (Murray) Burke, who operated it as a lodging house. They previously had lived at 533 Bennington in East Boston. 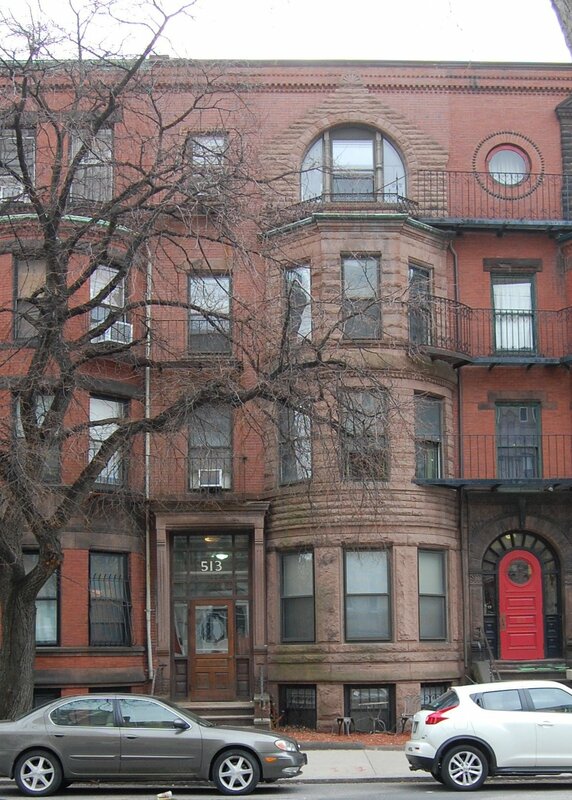 On August 1, 1941, Thomas and Ellen Burke purchased 513 Beacon from the Boston Five Cents Savings Bank. Nellie Burke died in April of 1954 and Thomas Burke died in July of 1955. On October 24, 1956, 513 Beacon was purchased from Thomas Burke’s estate by John J. Henderson and his wife, Mary E. Henderson. They operated it as a lodging house. They continued to live there until about 1961, when they moved to 51 Hereford. On August 18, 1961, 513 Beacon was purchased from the Hendersons by Solomon Kolodny. In September of 1961, he applied for (and subsequently received) permission to remodel the property, converting it from a lodging house into ten apartments. As part of the remodeling, he also received approval to add two stories to the rear ell, making it four stories high. On April 2, 1962, he transferred 513 Beacon to himself and his wife, Anita (Silverman) Kolodny as trustees of the Ansko Realty Trust. The property changed hands, including going through foreclosure, and was acquired on November 3, 1982, by real estate dealer George P. Demeter. On February 1, 1996, he transferred the property to Kings Limited Partnership, the general partner of which was King’s Inc. (of which he was the president). 513 Beacon remained an apartment building in 2018.